This Linea Changing Table with Foam Mat in White by luxury nursery furniture designer Leander is just one of the fabulous products we are delighted to add to the Cuckooland nest. Designed and made in Denmark, these quality innovative pieces add a touch of class to any child's bedroom. Linea means line. The collection reflects its name with clean sharp lines and an edgy urban feel yet still remaining feminine, sophisticated and soft. Whilst changing a baby's nappy, you are given precious quality time to spend with your little one. 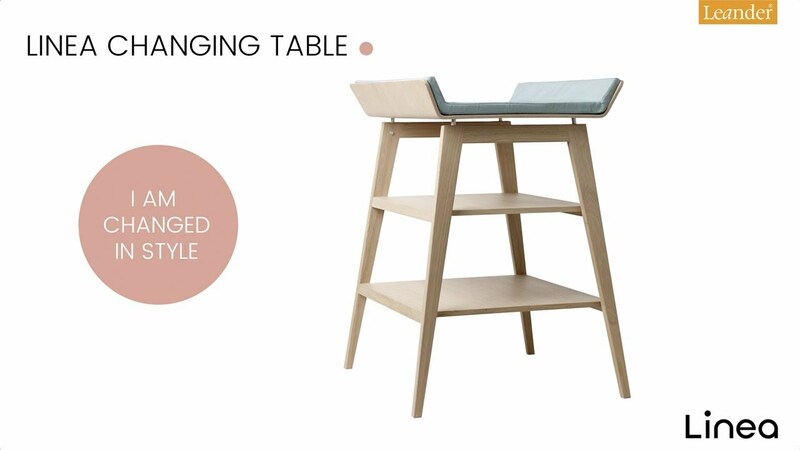 The Changing Table is a place for cuddles, giggles, heart melting and making memories. And let's face it, anything that can make the not-so-pleasant job of bottom wiping more bearable is money well spent! Part of the Linea nursery range, this contemporary changing table has safety at its core with raised sides to prevent your baby from rolling off the edges. Its height can also be adjusted so that whoever lands the task of nappy duty is able to work comfortably at an optimal height ensuring there are no aching backs (to go with the sleepless nights!) No child should ever be left unattended on a changing table, so the handy shelves have been designed to allow you to easily reach all essential bits and bobs you might need without having to leave the baby changing zone! Leander's aim is to create furniture that challenges materials and makes a difference to children and their parents; an ethos we, here at Cuckooland, wholeheartedly embrace. Brand: Leander. Designed and made in Silkeborg, Denmark. This is how it goes: in 1998 Stig Leander creates a new style of cradle for his sister-in-law who has twins; by 2005 Stig is exporting to 15 countries across Europe, Asia and Africa; followed by award after award in true err Stig Style! (Awards include 'Best Baby Product in Holland' ; First Prize Paris Salon Generation Bebe Exhibition' ; 'Innovation Award at the 2010 Baby Trade Fair in Switzerland' ; 'Initiative Award by Silkeborg Regional Federation'). With his Baby Furniture (Junior Beds, Cribs, Cots, Cradles, Changing Tables) now being shipped to over 40 countries including the US, Japan, China and Australia, Leander has maintained its fundamental values of building quality furniture that stimulates and keeps pace with a child's development, ensuring a natural environment in which safety, quality of craftsmanship and harmonious design are never compromised. All Stigs moulded pieces are manufactured using European Beech Wood sourced from sustainable European forests. We love the fact that Stig is still working away and exploring the characteristics of material and design with his trusty cardboard, string, glue and wood - looking at life and design through the eyes of a child whilst producing miniature prototypes for his marketing and production teams to pursue!